You have held several roles with the Army. Tell us about them. I joined the Army at the age of 16 and trained as a mechanic within the REME. I stayed in the regular force for seven years, serving twice in Iraq, and was one of the penultimate roulement soldiers on Operation Banner in Northern Ireland. It was whilst on OP TELIC 10 in 2007 that I came out. By 2008 I had started along the path to commissioning [becoming an officer], but decided to leave before completing this. As a civilian I started a degree in Professional Dance and Musical theatre, however didn’t manage to complete it due to injury – so I went out and auditioned for work as an actor and singer and secured my first contract. 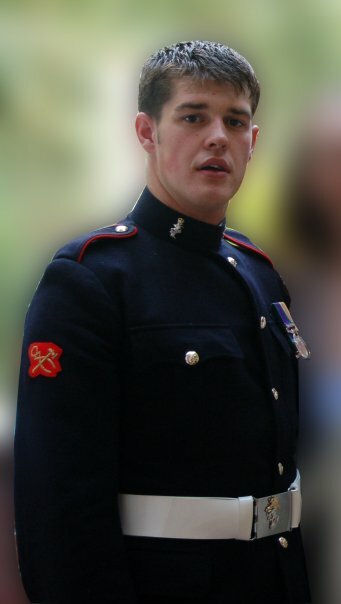 Having worked within that industry for four years and completing my goals to perform in the West End, I made the decision to return to the British Army. This time I joined the Reserves. Having commissioned in September 2013, I have now taken up post as B Troop Commander 580 Squadron Welsh Transport Regiment based in Cardiff. You recently commissioned from Sandhurst. How did you find officer training? Some of the course was pretty taxing on the old grey matter, especially when my contemporaries – most of them officer cadets from the University Officer Training Corps – had been playing with the subject matter for anywhere up to three years previously. I arrived at Sandhurst on the three-week Territorial Army Commissioning Course in September. It is a very demanding course as they have to assess you eligibility in such a short space of time compared to the forty-four weeks of the regular commissioning course. The course includes the longest exercise undertaken on any course at Sandhurst, with 8 days in the field. It was emotional, but very enjoyable and nothing will ever eclipse the moment when you march up the steps of Old College. On average it should take around a year for the whole process to run, however I managed it in around twelve weeks! You are also a player and coach of the Cardiff Lions RFC. What got you interested in gay rugby? Does the game teach you anything useful for life in the Army? Cardiff Lions is Wales’ first and only gay-friendly rugby team. I moved to Cardiff in November last year and when I came across the team in early February I was slightly nervous as to what I might find. The great surprise was that I found a very well run and welcoming team that I fitted into quickly. Within three months of me being there I was asked if I would like to take a larger role and become one of the coaching staff. So after a highly successful season that saw Cardiff Lions win the Plate competition at the Union Cup in Bristol, the Stonewall Sport of the Year award, and the regeneration of our annual 7s competition The Enfys Shield, I am looking forward to the upcoming season. This team has allowed me to play rugby as myself as opposed to playing as someone else – having to either hide, ignore or tolerate a level of banter due to my sexuality. Gay rugby with Cardiff Lions is just a group of guys that come together to play a sport they love and its all done in a supportive and open environment. Cardiff Lions isn’t a gay team, it’s a gay-friendly team, the difference being that we are not exclusive to gay men and have heterosexual men that play too. When it comes to teaching me anything useful for life in the Army, I’d have to say that there is no difference between the lessons learned from playing with a ‘straight’ team – it’s rugby. However there are lessons that can be gained from playing rugby that can aid you within your career in the British Army, and vice versa. The best way of explaining it would be to follow the values and standards of the British Army: selfless commitment, loyalty, discipline, courage. You give up your time to train in the snow and rain to develop a bond with those within your team which is ultimately transferred into the game when arriving at a break down and shown in your support or protection of a team mate. Of course, you cant watch or play a game of rugby without witnessing some form of physical courage. Not to mention the obvious fitness and social aspects. Rugby is a fantastic sport and I would encourage anyone and everyone to challenge themselves and have a go. Cardiff Lions are always recruiting!